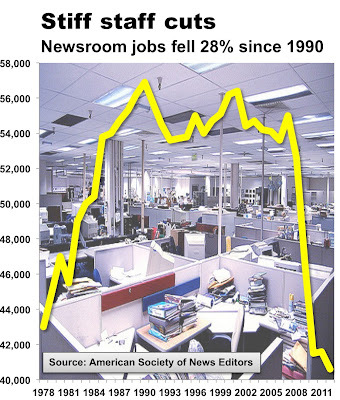 Newsroom jobs: We know about the big fall, but why the big rise in the ’80s? The plunge in newsroom jobs has been a big story in the industry over the last six or seven years, for obvious reasons. But a look at the bigger picture — newsroom employment over a span 30 years or so — add some interesting perspectives. Here’s a chart from Alan Mutter’s blog, “Reflections of a Newsosaur,” based on data from the American Society of Newspaper Editors. Alan’s blog talked about the staff cuts at the right end of the curve; hence the headline. And that’s where our industry has tended to focus. But let’s look at the left end of the curve — the huge rise from the late ’70s to about 1989. What on earth was going on in the nation’s newsrooms that caused employment to balloon from 43,000 to 57,000 — roughly 33 percent — in just 10 years? Two things. First, newspapers were enjoying a profitability boom. This was driven by the industry-wide adoption of new digital technologies that took out huge production costs. At my family’s small newspaper in Michigan, our composing room shrank from 24 jobs to 3, as hot-lead technologies were replaced by early digital output and pasteup solutions. Profit margins across the industry ratcheted up fast. Meanwhile, circulation was fairly flat, and the ad dollars were still pouring in. So the industry had money to spend. As the chart shows, a lot of it was spent on newsrooms. As I recall, there were two main drivers. First, as the new digital technologies moved page makeup into newsrooms, the work required some extra people. The early page layout systems were relatively crude, requiring a lot of “manual” labor at the keyboard. Second, the industry was in a sectionalizing boom. Virtually every paper added special-interest sections — Entertainment, Living/Lifestyle, Business, Health, Homes, Food, Outdoors — you name it. They needed reporters, editors, artists and photographers to staff them. What was that about? It stemmed from the recognition that the public’s interests were splintering in many personal directions, so the old, one-size-fits-all news product wasn’t enough. This was a direct result of the expanding media pipe I described in the first two installments of this blog — Part I and Part II. It was the beginning of the end of the Mass Media Era. We didn’t think about it this way at the time, but we were doing our best to turn a mass-interest product into a multi-interest product, trying to keep up with the diverging interests of our readers. Year by year, we kept recognizing additional interests that we felt we needed to serve. Thanks to falling production costs and healthy circulation and ad revenues, owners could afford to hire all those extra people. By about 1988/89, we had reached a newsroom employment plateau that would last almost 20 years, with only relatively minor fluctuations. Then the new Infinite Pipe smacked us hard. Revenues evaporated overnight, thanks to the recession and to Craigslist.com, Monster.com, Autotrader.com, Cars.com and other digital players. And the special interests we’d tried to serve with our new sections were, by then, being far better served by wildly proliferating special-interest websites, all going deeper into their specialties than our limited print sections could. Owners did what they had to do to stay in business, and the steep drop at the right end of the chart was the result. Amid the anguish and turmoil, it may have seemed that companies were emptying out the newsrooms without regard to the damage they caused. But the numbers tell a different story. The U.S. Bureau of Labor says total newspaper employment plunged from 414,000 in 2001 to 246,020 in 2011. That’s a 40.6% drop in 10 years. The American Society of Newspaper Editors says newsroom employment shrank from 56,400 to 40,566 from 2001 to 2012, a 28.1% drop. The Newspaper Association of America reports that total ad revenues fell from $49.3 billion in 2006 to $25.3 billion in 2012, about 50% in six years. So ad revenue fell by more than 50%, while jobs fell by 40%, and newsroom jobs by 28%. This makes it clear that the industry has been trying to cut costs besides people and to protect as many newsroom jobs as possible. Contrary to common belief, it appears newspaper owners are trying to keep jobs and preserve product value as much they can. That’s exactly what I’m seeing at the companies I’m able to track. What’s more, they’re doing it by being willing to make less money. Private newspaper companies don’t report their profit margins, and margins can be difficult to extract from public companies’ reports, but they’ve fallen from 20 to 30 percent (40 and higher in some specific cases) to a range of about 8 to 15 percent at many companies. This isn’t saintly self-sacrifice. Rather, in this massively disrupted industry, companies are doing the best they can to stay viable in the quality and quantity of the product they produce, the size of the audiences they reach, and the profitability that keeps shareholders from selling. It’s necessary for survival, and it’s a very tough juggling act. Not surprisingly, many of the extras are disappearing that were added during the ’80s newsroom growth boom. Sections have been disappearing and copy processing jobs have been consolidated. Owners are trying to create new levels of efficiency while keeping as many content-creation jobs as they can. We’re going back to what we did in the 1970s and before: Covering the most interesting and important local news that matters to the largest number of local people. In the process, has newspaper reporting become the worst job in America? CareerCast, a jobs and recruitment site, made a big PR splash recently when it announced its ratings of the country’s worst and best jobs. The media reports focused on the selection of newspaper reporter as worst, of course. We always seem to feast on bad news about our business. But wait: The best job is … actuary? Preparing estimates of the probability of death, disaster and other devastating occurrences? You get the excitement of accounting, plus all the enchantment of mathematical probabilities. Based on the Wikipedia definition, that job sounds like no fun at all. But the fact is, CareerCast didn’t say an actuary’s work is fun, or even interesting. Or that a reporter’s work isn’t. Their rating system gives no points for getting the opportunity to learn new things every day, for contributing to the welfare of society, for enabling people to make better decisions in their lives, for being able to ask important people discomfiting questions, or for the adrenalin rush of working on a big breaking story. No wonder reporting doesn’t score well. Instead, they rated jobs with a point system based on four “Core Criteria”: environment, income, outlook and stress. Based on those criteria and how they defined them, there’s little point in arguing. Yes, the stress is high, the pay is low, the chances for advancement have shrunk. But it’s also a fact that a lot of very intelligent people use very different criteria when determining what jobs are attractive, and many of them are still working in newsrooms. God bless ’em.